What a difference a year, and possibly an election, makes. 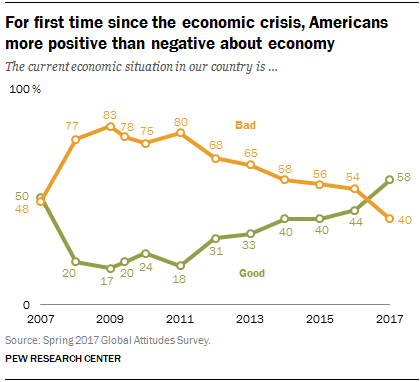 Nearly six-in-ten people in the United States (58%) say the economic situation is very or somewhat good, according to a new Pew Research Center survey conducted Feb. 16-March 15. Last spring, 44% of the American public described the economy as good. This is the most positive assessment of U.S. economic conditions since 2007, and only the second time that half or more of those surveyed have given the economy a thumbs-up. Driving the latest increase is a jump among Republicans over the past year. The 14-percentage-point rise in overall public opinion about the economy since last year is the largest one-year improvement in public sentiment about economic conditions in the history of this survey. The current rosy assessment stands in stark contrast to where opinion stood immediately after the beginning of the financial crisis in spring 2008, when just 20% said economic conditions were good. These findings track with the results of earlier polls by Pew Research Center , Gallup and others, though question wording in some cases is slightly different. All show public assessment of the economy has improved in the last year, mirroring changes in underlying economic conditions. In February 2017 (the last month for which data are available), the unemployment rate was 4.7%, down from 4.9% in February 2016; and the Dow Jones Industrial Average index was 20,812 in February 2017, up from 16,517 a year earlier. Strikingly, there is currently no major partisan difference in public views of the economy. But the more positive public assessment of the economy these days has been driven by changing Republican attitudes. Roughly six-in-ten Republicans (61%) and Democrats (60%) say conditions are very or somewhat good, with sentiment among GOP supporters roughly doubling in the past year. More than half (54%) of independents agree. Just a year ago there was a 26-percentage-point partisan difference on economic conditions, with Democrats being far more bullish on the economy than Republicans. This was the case throughout the Obama administration. Several demographic groups are particularly satisfied with the economy, including men, older Americans, wealthier Americans and those with more education. Middle-aged and older Americans have positive views of economic conditions. Roughly six-in-ten people ages 30 to 49 (61%) and 50 and older (59%) say the economy is very or somewhat good. And about half (49%) of Americans ages 18 to 29 agree. In the past year, perception of the economy has improved across all age groups. Positive views have gained by 7 percentage points among younger people, by 16 points among middle-aged Americans and by 15 points among older people. Two-thirds (67%) of those who make $75,000 or more a year think economic conditions are positive, as do roughly half of those who make less. College graduates and those with even more education are particularly happy with the economy, with 69% saying it is in good shape. But even those with less education – some college or a high school diploma or less – see current economic conditions as very or somewhat good.